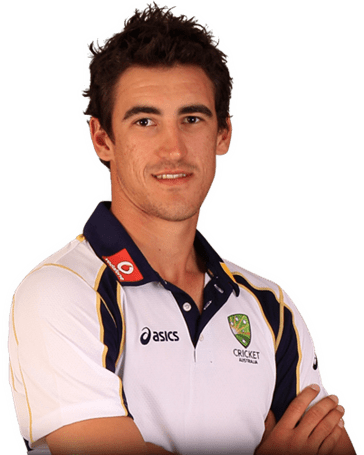 Mitchell Aaron Starc (born 30 January 1990), is an Australian cricketer who currently plays first-class cricket for the New South Wales Blues. He is a left-arm fast bowler and a capable lower order left-handed batsman. He was a prominent member of the victorious Australian squad that won the 2015 Cricket World Cup and was declared Man of the Tournament as a result of his consistent performances. Starc then became the fastest bowler to take (over) 100 ODI wickets on 21 August 2016 against Sri Lanka, doing so in 52 innings and breaking Saqlain Mushtaq's 19-year-old record, of taking 100 wickets in 53 innings. On 30 December 2016 against Pakistan in the Boxing Day test, he broke Andrew Symonds' record of the most sixes at the MCG in one innings, hitting 7 sixes. He is also a former junior cricketer for the Berala Sports Cricket Club in Sydney, Australia, who attended Homebush Boys High School also representing the school's 1st grade cricket team. He was known to wicketkeeper and bowl in the same innings during his time with the club. Mitchell Starc was also a representative cricketer of the Northern District Cricket Association (NDCA). Starc debuted for his home state New South Wales in 2009, at the age of 19. His performances for Western Suburbs and the state 2nd XI earned him the elevation and he replaced the suspended Aaron Bird for the final match of the season. Starc, gained a spot at the Centre of Excellence in the off-season in 2009. In eight Sheffield Shield games in the 2009–10 season he captured 21 wickets, including a best of 5 for 74 against Queensland, and also chipped in with a half-century. In 2015, Starc maintained his dominance at the international level by breaking records in the Australian domestic one-day tournament, which came about due to postponement of Australia's tour of Bangladesh. The pure numbers from Starc's tournament underline his dominance: 26 wickets from six matches at an average of 8.12 and a strike rate of 12.3. Starc was named as Player of the Tournament in the tournament in which New South Wales won. 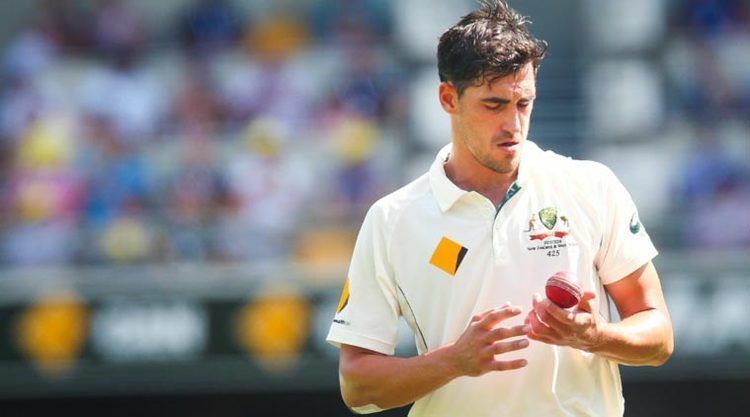 After a series of injuries to several senior Australian fast bowlers, Starc was a late replacement in the team to tour India in late 2010, replacing Josh Hazlewood. Later Doug Bollinger was injured after the First Test, and that left Starc and fellow uncapped young pacemen Peter George and James Pattinson competing for a place. George was selected, and after Pattinson was injured, Starc made his ODI debut against India in Visakhapatnam in October 2010. He did not bat and was wicketless. Starc made his Test debut for Australia on 1 December 2011 in the first Test of the two-Test series against New Zealand in Brisbane. He took two wickets in the match, and another two in the second Test in Hobart. He was left out of the squad named for the first Test of the subsequent series against India, but was recalled for the third Test on the pace-friendly WACA Ground in place of spinner Nathan Lyon, taking four wickets. Starc earned his first international call-up for Australia's 2010 tour to India, debuting in an ODI. In the Test series in India in 2013, he fell just one run short of a maiden Test ton. 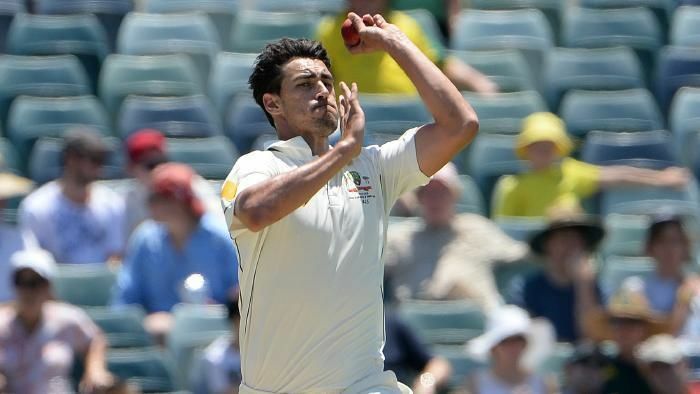 Starc was selected to play for the third test of South Africa's tour of Australia in 2012. Whilst Australia lost the match, Starc took 6/154 and achieved the second fastest test fifty (32 balls) by an Australian in Australia's second innings on 4 December. Despite his recent form, he was rested in favour of Jackson Bird to make his debut for the Boxing Day Test against Sri Lanka. They would both be selected for the Sydney Test a week later. Starc received the Man of the Tournament award in the 2015 Cricket World Cup, which Australia won, defeating New Zealand in the final. He also became Australia's leading wicket taker across all forms of first-class and international cricket for the 2014–15 season with 60 wickets, including the leading wicket taker for 2015 Cricket World Cup (22 at an economy rate of 3.58), having played one fewer game than New Zealander Trent Boult. Starc was adjudged Man of the Tournament in the 2015 Cricket World Cup. He also is the leading wicket taker in the world in all forms of international cricket for the 2015 calendar year with 87 after his ankle injury in the inaugural day-night test at Adelaide Oval. In the 2nd Test match of Australia's 2016 Sri Lankan away tour, he took his 100th Test wicket. He won the 2017 Allan Border Medal for the best Test bowler for his performance with the ball against Sri Lanka in 2016. He reached 1000 Test runs in Pune in the 2016–17 Border-Gavaskar Trophy against India. With this he became the 14th Australian cricketer to take more than 100 wickets and score more than 1000 runs in Test cricket. In 2012, Starc was signed by the Sydney Sixers for the inaugural Big Bash League, followed by the Champions League T20. In the 2014 Indian Premier League, he was bought by Royal Challengers Bangalore and quickly became their key bowler in the IPL 2015 edition. After missing the beginning of the tournament with injury, he came back and continued on with his good form from the World Cup. During the 2011–12 Australian summer, Starc also played for the Sydney Sixers in the inaugural Big Bash League. The Sixers won the tournament and Starc finished as its equal third-highest wicket-taker with 13 in six matches. He was later selected by Royal Challengers Bangalore in the IPL 2014 auction. 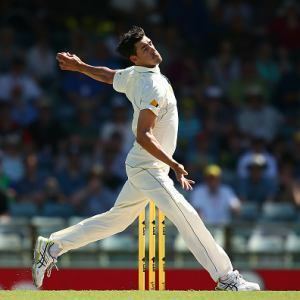 During the Third Test match of 2013 Border-Gavaskar Trophy in India, Starc became the first No. 9, 10 or 11 batsman to survive 100 balls in both innings. Starc is of Slovene descent. He is the older brother of Australian Olympic high jumper Brandon Starc. In 2015 Starc became engaged to fellow Australian cricketer Alyssa Healy and they married on 15 April 2016. The Starcs are only the third married couple to both play Test cricket, after Roger and Ruth Prideaux, who represented England in the 1950s and 1960s, and Guy and Rasanjali de Alwis, who represented Sri Lanka in the 1980s and 1990s. Starc supports the Greater Western Sydney Giants in the Australian Football League.